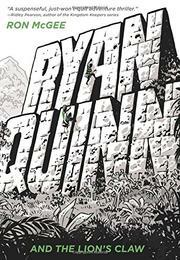 In his second novel, McGee follows up on Ryan Quinn and the Rebel’s Escape (2016) with another high-action adventure that reads much like the screenplays of his television movies. Newly minted New Yorker Ryan, having barely escaped his first life-threatening adventure, is still coming to grips with having learned his parents are key agents in the Emergency Rescue Committee. The white eighth-grader now understands why they’ve moved around so much and how his parents’ “games” have in reality been training him for undercover work all his life. It’s still a lot to take in. Life throws him a twist when his new best friend, Filipino-American computer nerd Danny, excited to do ERC work, stows away on a plane—and Ryan has no choice but to join him. With his parents out of town, Ryan and Danny find themselves caught up in an ERC mission of their own, trying to rescue two rebellious young rap stars who have been on the run from a repressive (fictional) government in Africa, where there is a price on their heads. And it appears that someone’s about to collect…unless Ryan and Danny can come to the rescue. The well-traveled Ryan’s previous experiences in Africa give McGee an opportunity to directly address the West’s dominant narrative, but whether he sufficiently interrogates it is open to question. Still, solid characters, snappy dialogue, and tons of action keep pages flipping.